Being pregnant with twins is always a blessing; however, it takes a lot of hard work to raise them. Frankly speaking, everything that you will buy for your kids will be in doubles as compared to other parents. You will need a double stroller, you will need two cribs, you will need two bassinets, and everything else will be in twos. Some parents are known to quit their jobs to take care of their lovely little ones. Isn’t it right to say that blessings come with a price? While you will have been blessed with your two bundles of joy, you will have to sacrifice some things in life to make them live a better life. You shouldn’t get worried though; there are people behind the scenes working hard to ensure that you singularize things and make your parenting life a little easier. This is by developing baby products like the best diaper bag for twins, the best baby jumper among other essential baby products. Today we would however like to narrow down on the best diaper bags for twins. Almost everything you have ever wanted to know about diaper bags for twins will be discussed in this article. Keep reading learn more about these best diaper bags for twins. This is an amazing bag that will be suitable for a mother of twins like you. It has 16 pockets, roomy interior compartments and is double styled. This gives you enough space to carry almost anything you will need as you travel. You can carry it using the messenger straps and tote strap as well. It also comes with patented shuttles clips which will allow you to attach the bag to the handlebars of a double stroller. If you feel that you want to carry it using the grab handles, the shoulder handles are removable giving it a simpler look that is convenient for portability. The main compartment is closed using magnetic closures. On it is a convenient cell phone pocket and pen holders. It comes with toy and pacifier holders as well. This bag can hold so many things needed by your twins as you travel making it one of the best diaper bags for twins. Measure 18 inches by 13.2inches by 3.5 inches. It is spacious enough for items needed by twins, made of the main compartment, 7 interior and 8 exterior pockets. Comes with shuttle clips which are designed in such a way that they can be attached to double strollers. The straps can be worn as messenger straps or tote straps. The shoulder strap is removable leaving the bag good looking and can be carried by hand. The material is rough making handling this diaper bag difficult. This is one of the best fashionable and trendy diaper bags for twins. It is made to fit all your babies’ essentials. You can comfortably carry it with you wherever you go with your lovely twins without feeling uncomfortable. It has adjustable shoulder straps, shorthand handles and stroller straps making it the best for a mum on the go. On the sides, it has 7 pockets which include the main compartment and two exterior side pockets with a zipper. This will help in securing your belongings and the belongings of your twins. The age of your babies will not matter when using this diaper bag as you can carry items that are ideal for children belonging to different age groups. It also comes with a matching changing pad that you can use when changing the soiled diapers. 2 side and 2 external pockets. It is made to meet fashion and functionality. It makes things more accessible as it can be attached to the stroller and comes with a changing pad. It is spacious as it includes seven pockets; two main compartments, 2 side pockets for feeding and water bottles, and 2 external pockets which are good for keeping wet things. The side pockets and the main compartment are secured using a zipper which makes the bag good for keeping precious items. Comes with a 100% guarantee. It has a plastic smell and fades when it is washed. Skip Hop has been one of the best brands releasing diaper bags since it was founded in 2003. They are known for high-quality products that are fashionable and trendy. 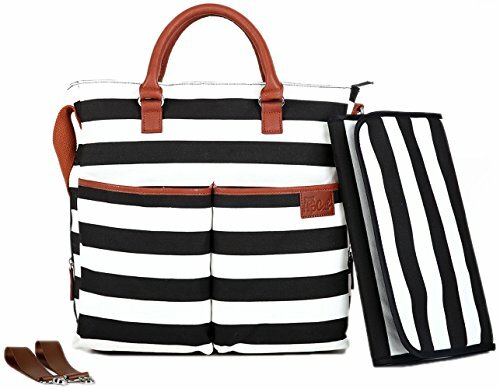 With this Duo Signature Diaper Bag, they have made it for parents with twins like you. For more storage, accessibility and stability, they have added a new panel design at the front side of the bag. The bag is closed by a zipper which allows your belongings inside the bag to be kept very safe. The shuttle clips convert this bag to a stroller bag. It also comes with side pockets which are meshed and elastic. These side pockets will fit most of the water bottle brands. For comfortable portability, it has grab handles and shoulder handles which are adjustable so that you may choose your best handle size. You can still store your other items inside this diaper bag beside diapers. Such items may include laptops and tablets of less than 15 inches. It also has a custom hardware for toys and pacifiers. Has front panel which adds more storage space which makes the bag suitable for moms with twins. The shuttle clips allow it to be hanged on a stroller making it good for a mom on the go. The adjustable shoulder straps and grab handles are good for a customized carrying style. It can hold personal items including laptops and tablets of less than 15 inches. Comes also with a D-ring custom hardware that one can be used to hang keys and toys. The top part does not open wide enough for quick access. If you are looking for a diaper bag that is ideal for both men and women, then this should be your perfect match. Let daddy not be left out in taking care of the twins. 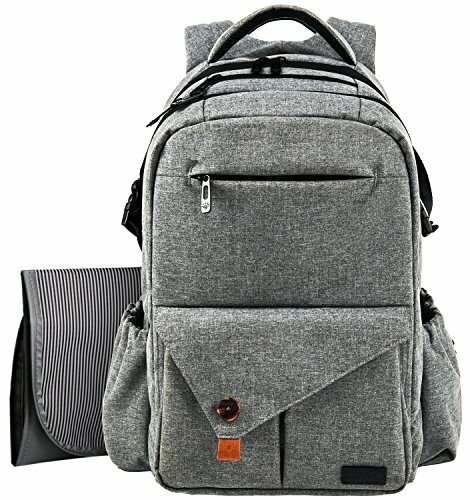 Hap Tim has made a unisex diaper backpack bag that will be good both for both parents. It is stylish and trendy which makes it good for long trips with your twins. You can also use it for out of home activities like camping and picnics. You shouldn’t worry about space when using this backpack bag; it is spacious to fit all your baby's items. These items will fit into the two zipper closure compartments with 17 pockets. The front compartment has 7 interior pockets which include 3 for bottles and 4 regular pockets. The back compartment, on the other hand, has 4 interior pockets which include one big regular pocket, one zipper pocket and 2 regular pockets. On the outer side are 2 side pockets which are suitable for wipers and bottles. On the back side is one exterior pocket that you can use to keep baby’s important things. With these many pockets, you can carry as many things as possible. Measure 25.7 inches by 14.2 inches. It has a huge capacity capable of holding twins’ diapers. Made with high-quality nylon garment fabric which is durable and waterproof. The bag also has non-fraying embroidery. Comes with high-performance zippers which are long-lasting. It is unisex making it stylish for mom and dad. Has wide stroller straps, grab handles and shoulder straps. The seams on the straps get worn easily after a number of uses. Why purchase from Bag Nation? We have a unlimited LIFETIME WARRANTY , we are a USA business  and we stand by our products and customers so much so we offer an extended 100 day return policy over Amazon's 30 Day. These are our five best diaper bags for twins that we hope will ease things as you raise your twins. They have good material construction, are spacious and have great portability. Finding the one that will precisely fit your little ones’ items will be hard, and that is why after considering space, we chose Skip Hop Duo Double Signature Carryall travel Diaper Bag as our best diaper bag for twins. It has 16 pockets; one main compartment, 7 exterior and 8 interior pockets and it is also double styled. That is enough space to carry almost anything you will need as you travel. You can carry it using the messenger straps and tote straps. In addition to these features, it has patented shuttles clips which will allow you to attach the bag to the handlebars of a double stroller. If you feel that you want to carry it using the grab handles, the shoulder straps are removable giving it a clean and a simpler look that is convenient for hand portability. It has pacifier and toy D-ring holders, and you can store your items alongside your twins’ gear using pockets like the cell phone pockets and the pen holders. To secure the compartments, you can use magnetic closures. These are just a few of the many good features that this bag has. The only limitation it has is that it has a rough material that will make it a little complicated to handle, but we believe that the amazing feature of this bag outnumbers this limitation. This is the diaper bag that we would advise you to consider first. Do you have twins? 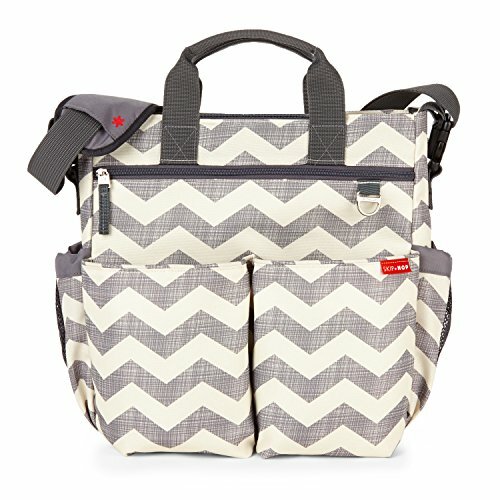 Which diaper bag for twins are you using to carry their diapers when you travel? 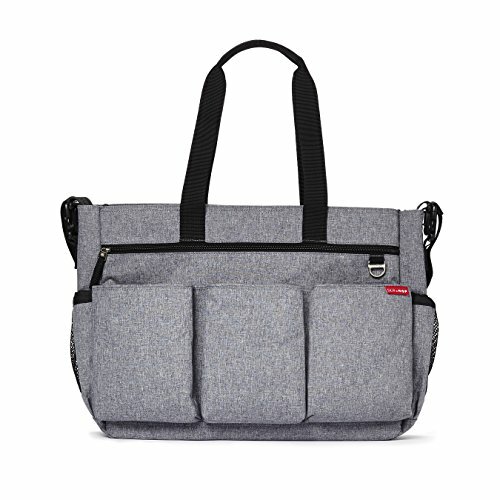 Have you ever used any of the diaper bags that we have discussed above? Do you intend to buy any soon? If you know another diaper bag brand that you would like us to review next time, please tell us about it, and we shall consider it. Whether you are going for a diaper bag to use as a traveling bag or a normal routine bag, carrying handles are of great importance. Diaper bags for twins are heavy by virtue of the fact that you will need more diapers, changing clothes, wipers and many more things. The number of items to be carried in the bag will make it heavy, and you will need varied carrying options. Try to look for that which can be carried as a messenger bag, tote bags or backpack bags. Messenger bags can sling across the chest making access easy and quick. Those with messenger straps are good for daddies and will give the dad a chance to nurse your lovely twins as well. They might however not be suitable for longer trips as they have limited spaces, but they can be used for short trips close to your home where more diapers can be accessed. 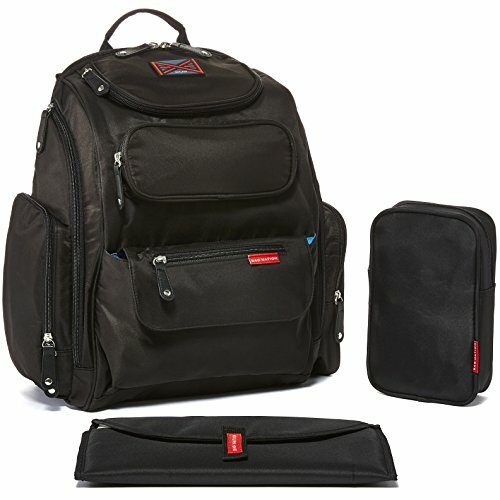 The backpacking diaper bags are good as they are hands-free and allow you to multitask. They are also good in weight distribution. They nonetheless offer limited accessibility; you will just access them by removing them from your back. What about when you are riding your little ones on a double stroller, what are you going to do? It will be hard to handle a tote or a messenger diaper bag and at the same time riding a double stroller. You will need a bag that will attach to the stroller. This means therefore that as you hunt for the best diaper bag for twins, you should carefully consider this feature. How the bag will be attached will also matter a lot. There are those that will have shuttle clips so that you can attach them to the handlebars. Others will come with straps so that you can just simply put them in the stroller. Being organized is very vital when handling baby items. You will need pockets to sort out diapers, wipers and feeding bottles. You will also need pockets to put your baby’s extra items like changing clothes and your own items like pens and water bottles. To cut the story short, the more the pockets, the better the diaper bag. A wet pouch is essential for a parent who has twins. These are two kids that will soil their diapers anytime. You will need something to help you change your babies’ diapers regardless of whether you are close to a changing station or not. Looking for a diaper bag that comes with a changing pad will be important for you. Most moms complain of the diaper bags that they bought being rigid, rough and not washable. Others will complain that the materials of the newly bought bags are light and have started wearing off. This is simply because they didn’t consider this fact. The material of the diaper bag will determine its durability, the ease to clean it and how fashionable it will be. Try to find the best one that combines quality, fashion and value. By doing so, you will have saved yourself a lot.